The day was spent in 17 hours of transit to our survey location. During the day the seas turned heavy with 4-6 foot seas and 9-11 foot swells. Even some of the crew and seaman had to hold onto the walls as they walked. The ship definitely rocked and rolled! This was a great test of the trans-derm scop patch to prevent sea-sickness. I was so surprised that it worked so well. ET John Skinner checked my computer to be sure it was virus free and then set up access to the ship’s email and internet. The ship receives internet through a satellite signal. All ship personnel have to take a computer security test in order to login to the ship’s network. 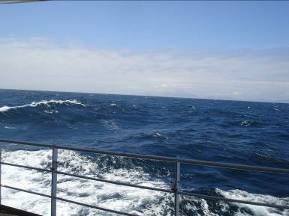 The Rainier sails through 10-foot swells! After completing my computer safety module, John took me and fellow Teacher at Sea, Jill Stephens, on a quick tour of the launch boats and described the technology installed on them. Each 29 foot launch boat is worth more than a million dollars with all the equipment aboard. John showed us the sound velocity meter, the high and low frequency multibeam echosounder transducers to send and receive the signal, and the computers that collect and store the data. (I’ll explain more about how these work in my next journal). 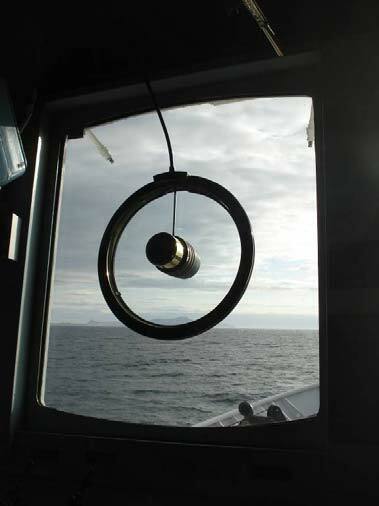 Each boat also has GPS (Global Positioning System), Iridium satellite phone, AIS ship identification (Automatic Identification System that broadcasts in the VHF frequency), marine RADAR, VHF marine radio, fathometer, compass, life raft, fire extinguishers and fire suppression systems. 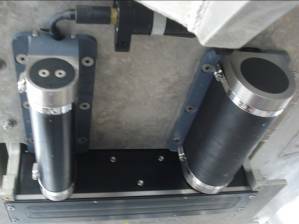 Here we see the low-frequency multibeam sonar on the left and the high-frequency multibeam sonar on the right. After dinner, the first POD (Plan of the Day) was posted. This is produced by the FOO (Field Operations Officer). I excitedly found my name on Launch # 5. Our mission tomorrow will be to find a safe anchorage for the ship on the south side of Ukolnoi Island. We will be surveying ocean floor that has not ever been charted before. It’s amazing how easy it is to fall into the ship’s routine here. Breakfast is at 7:00 am, lunch at 12 noon and dinner at 1700 (5:00PM). After dinner, I visit the Bridge and see the many instruments used to guide the ship safely. My favorite piece of equipment is the Clearview screen, or “rain spinner”. It has two pieces of glass that spin and keep the windshield clear of rain. I learn that all the weather data is taken here on the bridge and then submitted to NOAA for their meteorological database. Next, I visit the chart room where the survey techs process the data collected by the launches. Tonight, they are anxiously planning the areas to survey tomorrow. The people on the ship are so very interesting and friendly. It’s great to hear their stories of how they came to the ship and how much they enjoy the work they do. Sergio Taguba, our Steward, has been on the Rainier the longest of anybody? He’s been here for 36 years! 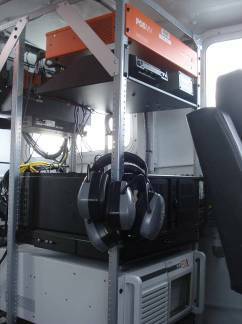 This entry was posted in 2009, Mary Patterson, NOAA Teacher at Sea and tagged Alaska, data processing, GPS, Hydrographic survey, multibeam sonar, noaa ship rainier, rain spinner, survival suit. Bookmark the permalink.